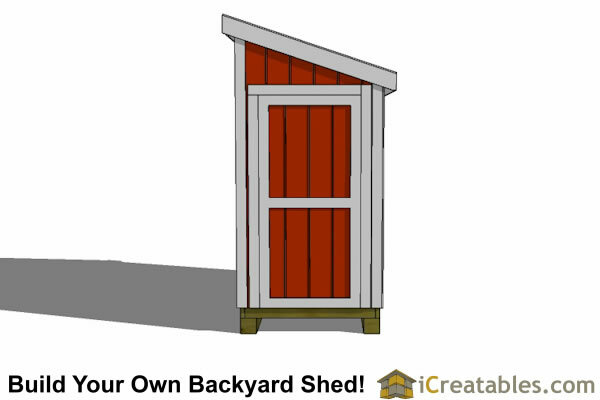 FREE - How To Build A Shed eBook included with every shed plans purchase. 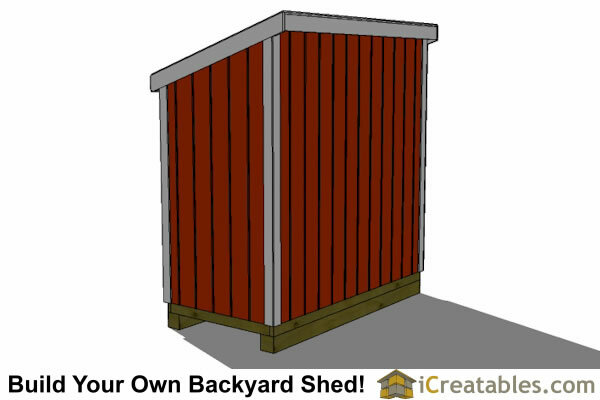 Cost Effective - Our shed plans are designed to make your shed simple and inexpensive to build. 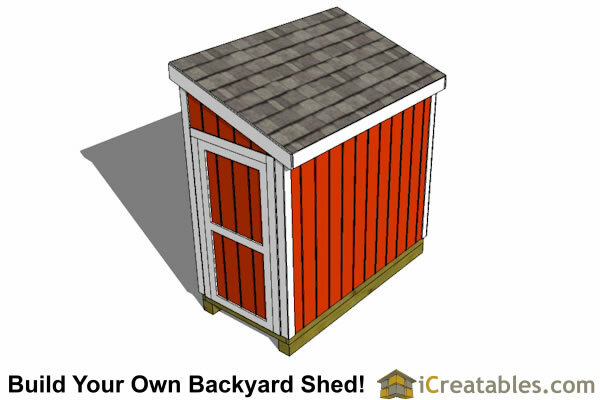 Easy To Build From - Professionally drawn with step by step instructions to show both an old pro or a first time framer how to build a shed. (see the plans example below). 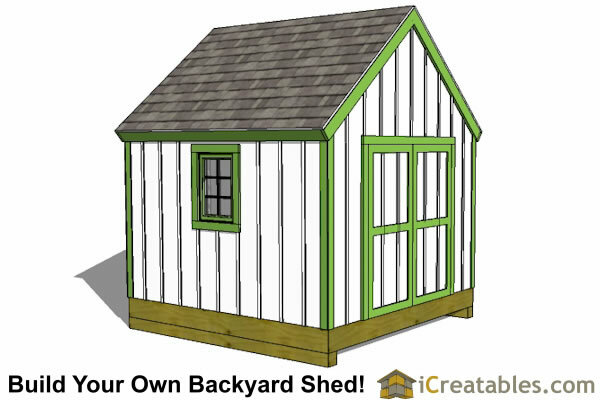 Start Now - Instant download - The shed plans are emailed to you when you purchase so you can start immediately. We use the free PDF file format so you can print them on your home printer or we can postal mail them to you. 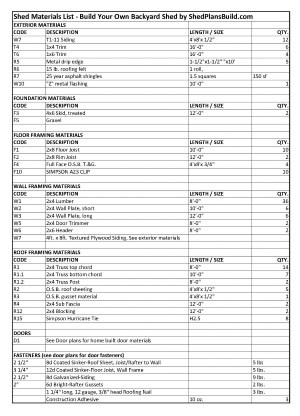 Materials List - Easily get bids and use the list numbering system to know what part goes where. 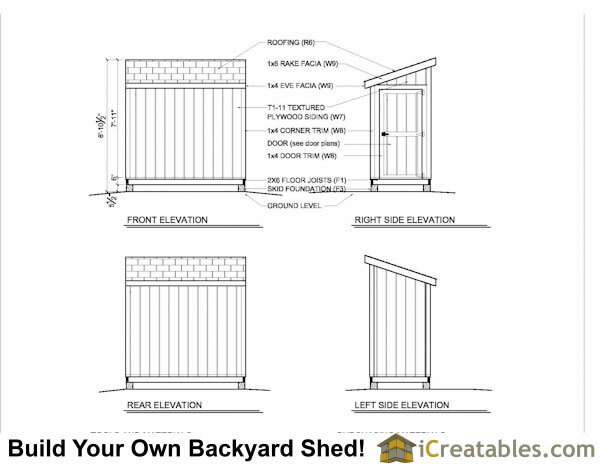 6'-5" wall height - This is the most cost effective wall height because it saves on material and allows the home built shed door to be on the front or back walls. 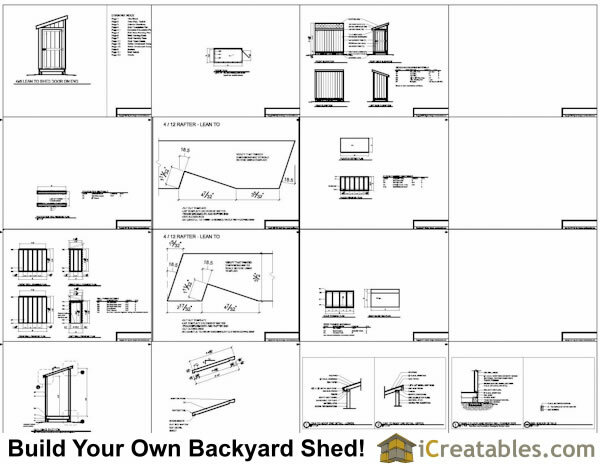 Home Built Door - These storage shed plans will instruct you how to build a 4x8 lean to storage shed with a single 2'-9"door on one of the ends. The end the door is on is changeable when building the lean to shed. 5 Foundations - Skid, concrete slab, poured concrete pier, concrete block pier, precast pier. 5 Foundations: There are 5 different foundations are included in the plans; Wood skid, Concrete slab, Concrete Block Pier, Poured Concrete Pier and Precast pier. Floor: 2x6 floor joists with 3/4" floor sheathing. Walls Framing: 2x4 framing at 16" on center with a double top plate, just like a home is framed. Door: 2'-9" x 5'-9" door is built using sandwich construction for strength and durability. 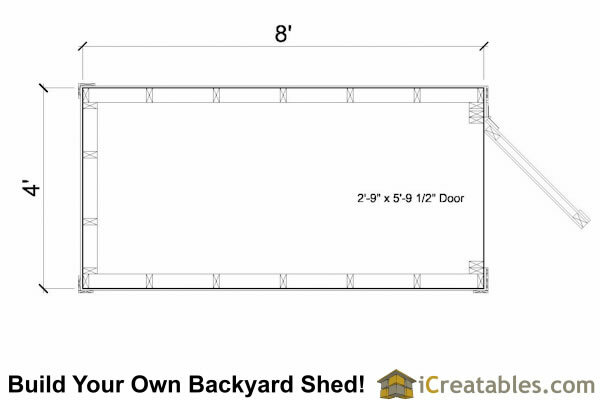 Our door plan shows you how to build a shed door that will outlive the shed. 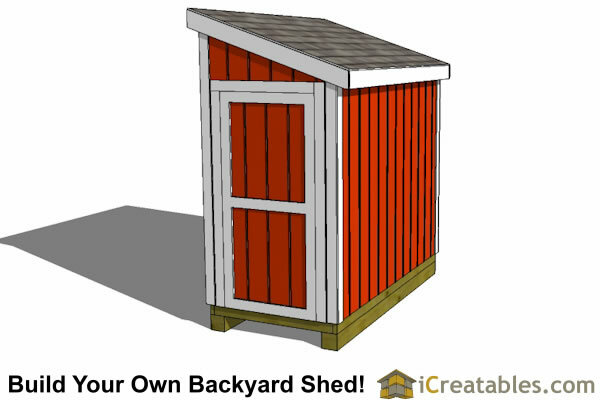 The shed door is built using a 2x4 inner frame faced on the inside with 1/2" O.S.B. and on the outside there is a layer of T-111 to match the rest of the shed. We use 3 hinges on the doors and the screws go into the inner 2x4 frame of the door to give extra strength. Siding: T-111 exterior siding. Other sidings such as vinyl may be used. Roof = The roof is framed using 2x4's to build the trusses. It is sheeted with 1/2" O.S.B. The plans give you the dimensions and cut angles so you can build the roof rafters on the ground and then put them up on the top plates. Roof Pitch: 4/12, this means that for every 4 inches of rise there is 12 inches of run horizontally. Roof Overhang: 4" on the front and back. 1" on the sides. Roofing = 25 year asphalt shingles. Trim = 1x3 and 1x6 wood, masonite or cement trim materials are used to finish the corners, roof eves, facia, and door. Floor Load: 50 pounds per square foot for framed floors. You don't want your shed floor to feel spongy. Roof Snow Load: 40 pounds per square foot. This is more than adequate for most areas. If you live in an area with a high snow load you should check with your local building department for your local snow load. Contact us and we can specify stronger roof framing.